The Small Arms Expert Marksmanship Ribbon was established on January 1, 1963, by Secretary of the Air Force Eugene M. Zuckert. 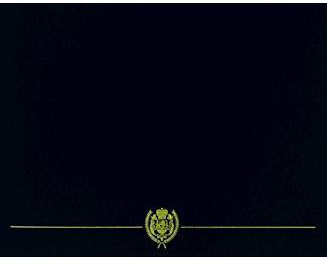 The Small Arms Expert Marksmanship Ribbon has been in effect since January 1, 1963. This ribbon is awarded to Air Force personnel who qualify as "expert" with either the M16 rifle or issue handgun on the Air Force qualification course. The Small Arms Expert Marksmanship Ribbon is worn after the Basic Military Training Honor Graduate Ribbon and before the Air Force Training Ribbon. The Air Force Small Arms Expert Marksmanship Ribbon may not be worn on the Navy uniform. The bronze service star is added to the ribbon for those person-nel who, after June 22, 1972, meet award criteria with both the M16 rifle and the issue handgun. This ribbon was authorized by the Secretary of the Air Force on Aug. 28, 1962. 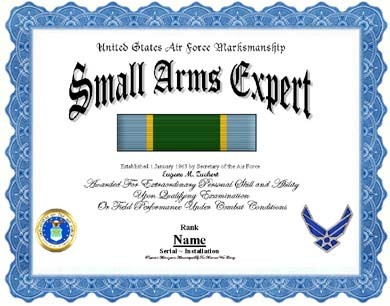 It is awarded to all U.S. Air Force service members who, after Jan. 1, 1963, qualify as "expert" in small-arms marksmanship with either the M-16 rifle or issue handgun. These rules will apply to the Air Force standard service small arms weapon selected. Qualifications as "expert" in both weapons after June 22, 1972, shall be denoted by a bronze service star worn on the ribbon. The ribbon has a very wide center stripe of laurel green, flanked on either side by a thin yellow stripe, with a wide light blue stripe at the edges.